We have previously shown that bacterial DNA activates human neutrophils in a CpG-independent manner. In this study, we have characterized the signaling pathways involved in the activation mechanism. We found that p38 MAPK, ERK1/2, and JNK pathways, as well as the PI3K/Akt pathway, are activated by bacterial DNA. We also determined that bacterial DNA induces NF-κB and AP-1 activation. When analyzing the role of these pathways on neutrophil functions, we observed that up-regulation of CD11b triggered by bacterial DNA was decreased by pharmacological inhibitors of the p38 MAPK, ERK1/2, and JNK, whereas stimulation of IL-8 release was dependent on p38, ERK1/2, and NF-κB. Moreover, we found that IL-8 production was markedly enhanced by inhibition of JNK, suggesting that this pathway negatively modulates NF-κB-dependent transcription. We also observed that bacterial DNA stimulated IL-1R-associated kinase-1 kinase activity and its partial degradation. Finally, we determined that bacterial DNA stimulated CD11b up-regulation in TLR9−/− but not in MyD88−/− mouse neutrophils, supporting that bacterial DNA induces neutrophil activation through a TLR9-independent and MyD88-dependent pathway. Neutrophils play a crucial role in the innate immune response to bacterial infections. Previously we demonstrated that neutrophils are able to discriminate between mammalian and bacterial DNA, being activated only by bacterial DNA. In contrast to the observations made in other leukocytes, our previous results support the notion that stimulation of human neutrophils by bacterial DNA is mediated through a CpG-independent mechanism (1). A growing number of reports suggest the existence of pathways unrelated to the presence of CpG motifs through which DNA may be able to trigger cell activation (2, 3, 4, 5). Moreover, in vivo studies conducted in transgenic mice lacking TLR9 evidenced a CpG-independent mechanism that contributes to toxic effects associated with systemic delivery of cationic lipid-plasmid DNA complexes in nonviral gene therapy protocols (3). However, the molecular basis underlying the CpG-independent mechanism of cell activation remains elusive. In this study, we analyzed the signaling events that take place upon neutrophil stimulation with bacterial DNA. We report here that stimulation of neutrophils with bacterial DNA triggers the activation of the MAPKs p38, ERK 1/2, and JNK, as well as PI3K/Akt pathway. Bacterial DNA also induces NF-κB and AP-1 activation. Our previous studies showing that the activation of neutrophils by bacterial DNA was not impaired by wortmannin and chloroquine, agents able to inhibit TLR9-DNA interaction, nor by immobilization of bacterial DNA suggested that TLR9 was not involved in the activation mechanism (1). Supporting this hypothesis, in this study, we found that neutrophils from TLR9-deficient mice were able to up-regulate CD11b in response to bacterial DNA stimulation. However, because the pathogen recognition capacity of neutrophils mostly rely on TLR (6) and considering that their stimulation usually leads to the activation of MAPKs, PI3K, NF-κB, and AP-1 (6, 7, 8, 9), in the present study, we evaluated the involvement of TLR/IL-1R signaling pathway in neutrophil activation by bacterial DNA. We observed that stimulation of human neutrophils by Escherichia coli DNA led to an increase in IL-1R-associated kinase (IRAK)-1 kinase activity and to its partial degradation. In accordance, neutrophils derived from MyD88−/− bone marrow chimeric (BMC)3 mice were not activated by E. coli DNA, suggesting that bacterial DNA signals neutrophils through a MyD88-dependent pathway. The studies performed in this work have been reviewed and approved by the institutional review board. Endotoxin-free reagents and plastics were used in all experiments. RPMI 1640 and PBS were purchased from HyClone. Human albumin was purchased from Laboratorio de Hemoderivados (Universidad Nacional de Cordoba). Penicillin/streptomycin and 2-ME were purchased from Invitrogen Life Technologies. PE-conjugated anti-human CD11b (catalog no. IM2581) was purchased from Immunotech. Rabbit polyclonal Abs against Thr180/Tyr182-phosphorylated p38 MAPK (catalog no. 9211), Thr308-phosphorylated Akt (catalog no. 9275), mouse mAb against Thr202/Tyr204-phosphorylated ERK1/ERK2 (catalog no. 9106), and HRP-conjugated goat anti-mouse Ab (catalog no. 7076) were obtained from Cell Signaling Technology. Anti-phospho-Thr186/Tyr185-JNK (catalog no. sc-6254), anti-NF-κB p50 (catalog no. sc-7178), and p65 (catalog no. sc-372), anti-c-Jun (catalog no. sc-16312R), anti-Ser189/207-phosphorylated mitogen-activated protein kinase kinase (MEKK)3/MEKK6 (catalog no. sc-8407), anti-MEKK3 (catalog no. sc-961), and anti-TNFR-associated factor 6 (TRAF6) (catalog no. sc-7221) were purchased from Santa Cruz Biotechnology. Anti-IRAK-1 Ab (catalog no. 06-872) was purchased from Upstate. Rabbit polyclonal anti-MyD88 Ab (catalog no. 14-6223), PE-conjugated anti-mouse CD11b (catalog no. 12-0112), and FITC-conjugated anti-mouse Ly-6G (Gr 1) (catalog no. 11-5931) were purchased from eBioscience. Anti-IκBα rabbit polyclonal Ab (catalog no. 554135) and HRP-conjugated goat anti-rabbit IgG Ab (catalog no. 554021) were purchased from BD Pharmingen. PD98059 (MEK inhibitor), SB203580 (p38 MAPK inhibitor), SP600125 (JNK inhibitor), N-acetyl-leucinyl-leucinyl-norleucinal (ALLN) (Calpain inhibitor I), and 4-(2-aminoethyl) benzenesulfonylfluoride (AEBSF) were obtained from Calbiochem. E. coli LPS (E. coli O111:B4), aprotinin, leupeptin, pepstatin, PMSF, SDS, Triton X-100, β-glycerophosphate, and PMA were purchased from Sigma-Aldrich. The synthetic lipopeptide Pam3-Cys-Ser-Lys4 (Pam3CSK4) was purchased from InvivoGen. DNA from E. coli was purchased from Sigma-Aldrich or from Worthington Biochemical. DNA was purified by extraction with phenol:chloroform:isoamyl alcohol and ethanol precipitation (1). Where indicated, DNA digestion was conducted in PBS containing 1 mM CaCl2, 1 mM MgCl2, and 2 U DNaseI/μg DNA. The reactants were incubated 2 h at 37°C, and DNase was inactivated by heating during 10 min at 95°C. Free nucleotides were removed by dialysis. Blood samples were obtained from healthy donors by venipuncture of the forearm vein. Neutrophils were isolated from heparinized human blood by Ficoll-Hypaque gradient centrifugation (Ficoll Pharmacia; Hypaque, Winthrop Products) and dextran sedimentation as described previously (10). Contaminating erythrocytes were removed by hypotonic lysis. After washing, the cells (>96% of neutrophils on May-Grunwald-Giemsa-stained cytopreps) were resuspended in RPMI 1640 supplemented with 5 mg/ml endotoxin-free human albumin, 100 U/ml penicillin, and 100 μg/ml streptomycin (complete medium). Human albumin was used for protein supplement medium instead of FCS to avoid possible effects produced by contaminating LPS of the DNA samples since, as we and others have demonstrated, under these conditions, LPS fails to activate neutrophils (1, 11, 12). In experiments where LPS was used as a positive control, cells were suspended in FCS-supplemented medium. The expression of the surface marker CD11b was evaluated by flow cytometry. Neutrophils suspended in complete medium (5 × 106/ml) were preincubated in the presence or absence of the indicated specific pharmacological inhibitors: PD98059 (5 μM), SB203580 (5 μM), SP600125 (10 μM), or wortmannin (50 nM) for 15 min at 37°C and thereafter were incubated with or without E. coli DNA (100 μg/ml) for 15 min at 37°C. Then, neutrophils were stained with PE-conjugated anti-CD11b mAb or isotype control mAb for 20 min at 4°C. Fluorescence was measured with a FACScan argon laser flow cytometer (BD Immunocytometry Systems). Data were analyzed by using CellQuest software (BD Biosciences). Neutrophils suspended in complete medium (5 × 106/ml) were seeded into round-bottom 96-well plates and were preincubated in the presence or absence of the indicated specific pharmacological inhibitors: PD98059 (5 μM), SB203580 (5 μM), SP600125 (10 μM), ALLN (10 μM), or wortmannin (50 nM) for 15 min at 37°C and then were subjected to stimulation with E. coli DNA (100 μg/ml) or medium (control) and were cultured for 3 h at 37°C. Culture supernatants were collected, and IL-8 concentration was measured by ELISA (R&D Systems). The EMSA was performed essentially as described previously (13). Cells were stimulated with E. coli DNA for the indicated times and then transferred into precooled tubes containing equivalent volumes of ice-cold PBS supplemented with PMSF (1 mM, final concentration) before centrifugation at 2000 × g for 2 min at 4°C. Cell pellets were washed and resuspended in ice-cold low-salt lysis buffer A (10 mM HEPES (pH 7.90), 10 mM KCl, 1.5 mM MgCl2, and 0.5% Nonidet P-40) containing an anti-protease mixture (1 mM PMSF, 1 mM AEBSF, 100 μg/ml aprotinin, 10 μg/ml leupeptin, 10 μg/ml pepstatin, and 1 mM DTT, final concentrations). Following a 10-min incubation period, cells were centrifuged at 800 × g (10 min, 4°C). The supernatants (nonnuclear fractions) were collected, and the nuclear pellets were washed with a high-salt buffer B (10 mM HEPES (pH 7.9), 0.42 M KCl, 1.5 mM MgCl2, 0.25 M EDTA, and 20% glycerol) containing the anti-protease mixture by continuous shaking for 15 min at 4°C. Then, samples were centrifuged (14,000 × g, 15 min, 4°C); the resulting supernatants (the nuclear extracts) were aliquoted and stored at −70°C. The binding of extracted protein to DNA was performed in buffer C (10 mM HEPES (pH 7.9), 60 mM KCl, 0.25 M EDTA, and 20% glycerol) containing the anti-protease mixture. Five micrograms of nuclear extract proteins was incubated with 1 ng of 32P end-labeled oligonucleotides (ODNs) comprising the consensus sequences for AP-1 (5′-CGCTTGATGCAGCCGGAA-3′) or NF-κB (5′-AGTTGAGGGGACTTTCCCAGGC-3′) and 200 μg/ml poly(deoxyinosinic-deoxycytidylic acid) for 20 min at room temperature. The DNA-protein complex formed was separated from free ODN on 5% native polyacrylamide gels. The specificity of binding was examined by competition with unlabeled ODNs and by preincubation with mAbs specific for the transcription factor of interest. The gels were dried under a vacuum and autoradiographed at −70°C. Neutrophils (4 × 106) suspended in complete medium were prewarmed for 15 min at 37°C and were then stimulated with E. coli (100 μg/ml) for 0–30 min at 37°C. The reactions were terminated by addition of 1 ml of ice-cold saline with 1 mM PMSF and rapid centrifugation. The pellets were immediately frozen in dry ice after aspiration of the supernatants, then were dissolved in a sample buffer (2% SDS, 10% glycerol, 5% 2-ME, and trace amounts of bromphenol blue dye in 62.5 mM Tris-HCl (pH 6.8)), heated for 5 min at 95°C, and stored at −70°C until subjected to gel electrophoresis. After SDS-PAGE, proteins were electotransferred from the gel to polyvinylidene difluoride membranes (Millipore) for 2 h and then blocked in PBS containing 0.05% Tween 20 and 5% nonfat milk or 2.5% BSA for 1 h at 25°C. The membranes were immunoblotted with the indicated Abs overnight at 4°C. After washing, bound Abs were visualized with HRP-conjugated Abs against rabbit or mouse IgG by using the ECL Western Blotting System (Amersham Biosciences). Neutrophils (15 × 106) suspended in 0.5 ml of complete medium were prewarmed for 15 min at 37°C and then were stimulated with E. coli DNA (125 μg) or medium. After the incubation for the indicated times, reactions were stopped with 5 ml of ice-cold saline with 2 mM PMSF and rapid centrifugation. Then, the pellets were immediately frozen in dry ice after aspiration of the supernatants. Afterward, the pellets were lysed with 0.5 ml of ice-cold extraction buffer containing 20 mM HEPES (pH 7.4), 150 mM NaCl, 1% Triton X-100, 40 mM β-glycerophosphate, 1.5 mM MgCl2, 1 mM EGTA, 1 mM EDTA, 2 mM DTT, 20 mM NaF, 2 mM sodium orthovanadate, 5 mM PMSF, 100 μg/ml aprotinin, 10 μg/ml leupeptin, 10 μg/ml pepstatin, and 1 mM AEBSF. Following a 15-min incubation period on ice, samples were briefly vortexed, transferred to microtubes, and centrifuged at 13,000 × g, 10 min, at 4°C. Supernatants were collected, and protein concentration was determined using the Micro BCA Protein Assay Reagent kit, according to the manufacturer’s instructions (Pierce). Extracts with equal amounts of proteins were used for immunoprecipitation. The cell lysates (500 μg) were precleared by mixing with control rabbit IgG Abs (matched isotype) plus protein A-Sepharose beads (Amersham Biosciences) for 1 h at 4°C. Then, 4 μg of rabbit polyclonal IgG specific for IRAK-1 (Upstate Biotechnology) was added to the precleared lysates and incubated at 4°C for 2 h on a rotator. Then, immune complexes were captured by the addition of 50 μl of prewashed protein A-Sepharose bead slurry (Amersham Biosciences) and by incubation in a rotator for 1 h at 4°C. Sepharose beads were washed three times in ice-cold lysis buffer and then mixed 1:1 with 2× sample buffer and boiled 5 min. Then, samples were subjected to SDS-PAGE, transferred to polyvinylidene difluoride membrane and immunoblotted with rabbit polyclonal Ab anti-TRAF6 and anti-MyD88 and detected with ECL. Anti-IRAK-1 immunoprecipitates, obtained as indicated above, were washed twice in kinase reaction buffer (12.5 mM MOPS (pH 7.5), 12.5 mM β-glycerophosphate,7.5 mM MgCl2, 0.5 mM EGTA, 0.5 mM NaF, and 0.5 mM sodium orthovanadate). Thirty microliters of the same buffer supplemented with 1 mM DTT, 40 μg of myelin basic protein (MBP) (Sigma-Aldrich), 50 μM ATP, and 10 μCi of [γ-32P] ATP (30 Ci/mmol) was then added to each sample and incubated at 25°C for 30 min. SDS sample buffer was added after incubation, and the samples were subjected to SDS-PAGE analysis. The gel was dried and exposed to x-ray film. C57BL/6 (H-2b) mice were purchased from the Division of Animal Production, Animal Core Facility, Faculty of Veterinary Sciences, La Plata University. Male mice (7–8 wk age) were gamma irradiated (900 rad) and reconstituted with 5 × 106 MyD88-deficient, TLR9-deficient, or control bone marrow cells to generate MyD88−/−, TLR9−/−, or wild-type chimeras. MyD88−/−,TLR9−/− bone marrow-derived cells were a generous gift from S. Amigorena (Centre de Développement des Techniques Avancées pour l’Expérimentation Animale, Orleans, France). At 6–8 wk postreconstitution, BM cells were aspirated and layered over a discontinuous density gradient composed by Histopaque 1077 and 1119 (Sigma-Aldrich) as described previously (14). Two bands, one enriched with neutrophils and another in mononuclear cells, were isolated by centrifugation. Then, mononuclear cells were cultured for 24 h in bicarbonate-buffered RPMI 1640 supplemented with 10% FCS, 50 U/ml penicillin, 50 μg/ml streptomycin, 0.1 mM nonessential amino acids, and 0.055 mM mercaptoethanol. Then, nonadherent cells were removed, and the ability of adherent cells to produce IL-6 and TNF-α in response to a CpG-ODN, LPS, or PMA was tested by intracellular flow cytometry. As expected, MyD88−/− adherent cells did not produce neither IL-6 nor TNF-α when stimulated by the TLR agonists CpG-ODN or LPS but produced these cytokines when stimulated by PMA. On the other hand, TLR9−/− adherent cells did not respond to CpG-ODN stimulation but produced cytokines when stimulated by PMA (data not shown). Wild-type chimeric-derived macrophages produced cytokines in response to all agonists (data not shown). The neutrophil-enriched band obtained from the Histopaque gradient contained 70–75% of high Gr 1 cells. Neutrophils were stimulated with either E. coli DNA (1–100 μg/ml), the synthetic tripalmitoylated lipopeptide Pam3CSK4 (1 μg/ml), or PMA (20 ng/ml) for 1 h at at 37°C. Then, cells were stained with FITC-conjugated anti-Gr 1 and PE-conjugated anti-CD11b mAb or isotype controls mAbs during 20 min at 4°C. Fluorescence was measured with a FACScan argon laser flow cytometer. Data were analyzed by using CellQuest software (BD Biosciences). Statistical significance was determined using the nonparametric Friedman test for multiple comparisons with Dunn’s posttest or Student’s t test. Statistical significance was defined as p < 0.05. Many different neutrophil responses, including chemotaxis, exocytosis, respiratory burst activity, cytokine, and chemokine synthesis, as well as regulation of cell survival, are mediated by the activation of MAPKs. In fact, activation of overlapping but distinct MAPK subtype cascades has been demonstrated in human neutrophils stimulated with different agonists (15, 16, 17, 18, 19). Therefore, to delineate the signaling intermediates activated by bacterial DNA, neutrophils were stimulated with E. coli DNA (100 μg/ml) for different times at 37°C. Samples were harvested at indicated time points and subjected to Western blotting to assess activation of p38 MAPK, ERK, and JNK. Activation was revealed by using Abs against the phosphorylated forms of each protein. As shown in Fig. 1⇓a, p38 MAPK was strongly phosphorylated by E. coli DNA stimulation. The phosphorylation of p38 MAPK was detected at 5 min after stimulation with bacterial DNA, but maximal activation was observed at 10 min, followed by gradual decrease by 30 min poststimulation. As expected, degradation of bacterial DNA with DNase I abolished its ability to induce p38 MAPK activation (Fig. 1⇓b). An increased phosphorylation of ERK1 and ERK2 was also induced by bacterial DNA (Fig. 1⇓c). The kinetic of ERK phosphorylation paralleled that observed for p38 MAPK; however, some phosphorylated ERK 1/2 was consistently observed in unstimulated neutrophils. Furthermore, a transient and time-dependent phosphorylation of JNK was observed in neutrophils stimulated with bacterial DNA (Fig. 1⇓d); however, it was slower in onset, reaching a peak within 15 min. Degradation of bacterial DNA with DNase I eliminated its ability to induce ERK1/2 and JNK activation (data not shown). All blots were probed with Abs recognizing the housekeeping protein β-actin to rule out that the differences between the levels of phosphorylated proteins were due to distinct protein loading. Neutrophil MAPKs are activated by bacterial DNA. Neutrophils were stimulated by E. coli DNA (100 μg/ml) for the indicated times at 37°C. Phosphorylation of the MAPKs p38 (a and b), ERK1/2 (c), and JNK (d) was analyzed by immunoblotting using specific Abs against the phosphorylated forms of each protein. 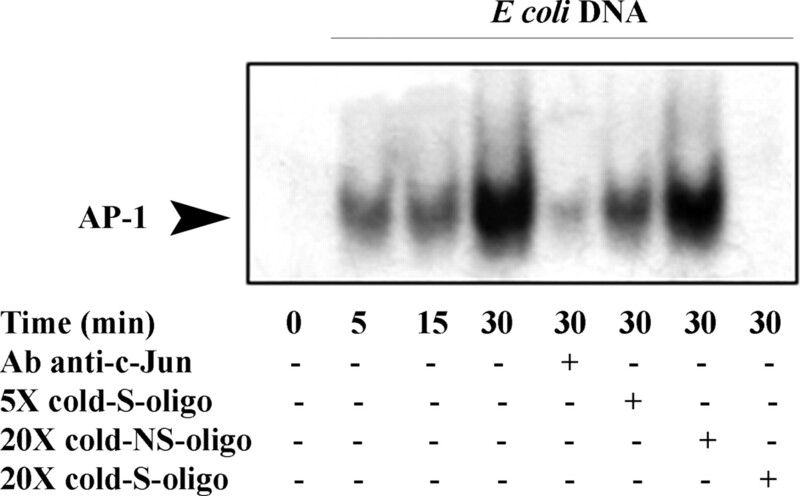 b, Neutrophils were stimulated with whole-size E. coli DNA of degraded E. coli DNA, and phosphorylation of p38 was analyzed by immunoblotting as described above. Immunoblots are representative or at least three independent experiments. e, Pharmacological inhibitors of MAPKs prevent bacterial DNA-induced phosphorylation of MAPKs. Cells were treated with SB203580 (5 μM), PD98059 (5 μM), or SP600125 (10 μM) for 15 min at 37°C, followed by stimulation with E. coli DNA (100 μg/ml) for 10 min (for p38 and ERK1/2 detection) or for 15 min (JNK detection). Then, MAPK phosphorylation was assessed as described above. f, Bacterial DNA induces neutrophil MEKK3/MEKK6 phosphorylation. Neutrophils were stimulated by E. coli DNA (100 μg/ml) for the indicated times at 37°C. Phosphorylation of MEKK3/MEKK6 was analyzed by immunoblotting using mouse polyclonal Abs against the phosphorylated forms of each protein. Equal loading was determined by blotting with rabbit polyclonal anti-MEKK3 Ab. Immunoblots are representative of three independent experiments. As expected, the addition of the specific pharmacological inhibitors of MAPKs, SB203580 (p38 MAPK inhibitor), PD98059 (MEK-ERK kinase-inhibitor), and SP600125 (JNK inhibitor), to neutrophil cultures before stimulation with E. coli DNA markedly reduced p38 MAPK, ERK, and JNK phosphorylation, respectively (Fig. 1⇑e). Because MEKK3 is capable of activating JNK and p38 MAPK (17, 20), we also determined whether this kinase was activated by bacterial DNA. Neutrophils were stimulated with E. coli DNA (100 μg/ml) for different times at 37°C. Samples were harvested at indicated time points and subjected to Western blotting with anti-phospho-MEKK3/MEKK6 polyclonal Ab to assess activation of these kinases. As shown in Fig. 1⇑f, bacterial DNA induced the phosphorylation of a band consistent with MEKK3/MEKK6. We have previously demonstrated that bacterial DNA triggers neutrophil activation by inducing L-selectin shedding, CD11b up-regulation, cellular shape changes, IL-8 secretion, and cell migration. Thus, to analyze the role of MAPKs in neutrophil activation induced by bacterial DNA, we examined the effect of the specific pharmacological inhibitors of MAPKs on both the production of IL-8 and CD11b up-regulation. We used concentrations of inhibitors that have been shown to be specific for each MAPK (17, 21) and that slightly modify, per se, activation parameters. As shown in Fig. 2⇓, a and b, both SB203580 and PD98059 significantly reduced CD11b up-regulation and IL-8 secretion induced by E. coli DNA, albeit complete inhibition was never observed. Contrastingly, the JNK inhibitor, SP600125, significantly inhibited CD11b up-regulation but up-regulated IL-8 production induced by bacterial DNA (Fig. 2⇓, c and d). Effect of pharmacological inhibitors of MAPKs on neutrophil activation induced by bacterial DNA. CD11b up-regulation (a and c) and IL-8 production (b and d) by neutrophils incubated with E. coli DNA (100 μg/ml). Cells were pretreated with SB203580 (5 μM), PD98059 (5 μM), or SP600125 (10 μM) for 15 min at 37°C, followed by stimulation with E. coli DNA (100 μg/ml) for 20 min (for CD11b detection) or 3 h (for IL-8 detection). Results are expressed as percentage of up-regulation of CD11 expression (a and c) or as picograms per milliliter of IL-8 released to culture supernatant per 106 neutrophils (b and d). Data represent the mean ± SEM of six experiments. ∗, p < 0.01 and ∗∗, p < 0.05 compared with DNA-stimulated cells. Several reports indicated that PI3K and the downstream serine/threonine kinase Akt/protein kinase B are involved in modulating neutrophil activation, chemotaxis, and apoptosis (22, 23, 24). Other studies have shown that the PI3K/Akt pathway negatively regulates NF-κB and the expression of inflammatory genes (25, 26). To evaluate whether bacterial DNA induces PI3K/Akt activation, neutrophils were stimulated by E. coli DNA, and Akt activation was determined by immunoblotting with a specific Ab to phosphorylated Akt. Fig. 3⇓a shows that exposure of neutrophils to E. coli DNA resulted in Akt activation. Phosphorylation of Akt was slower in onset than MAPKs activation and remained detectable even at 30 min poststimulation, the last time point determined. Addition of the specific pharmacological inhibitor of PI3K, wortmannin (50 nM), used at a concentration that does not inhibit other non-PI3Ks (23), nearly abolished Akt phosphorylation (Fig. 3⇓b). PI3K/Akt activation in neutrophils stimulated by bacterial DNA. a, Neutrophils were stimulated by E. coli DNA (100 μg/ml) for the indicated times at 37°C. Phosphorylation of Akt was analyzed by immunoblotting using a specific Ab against the phosphorylated form of the protein. Pervanadate is shown a positive control. b, Wortmannin prevents Akt phosphorylation induced by bacterial DNA. Cells were treated with wortmannin (50 nM) for 15 min at 37°C, followed by stimulation with E. coli DNA (100 μg/ml) for 10 min. Then, Akt phosphorylation was assessed as described above. c, PI3K is not involved in bacterial DNA-induced p38 or ERK1/2 activation. Cells were treated with wortmannin (50 nM) for 15 min at 37°C, followed by stimulation with E. coli DNA (100 μg/ml) for 10 min. Afterward, p38 and ERK1/2 phosphorylation were evaluated as described above. d, PI3K is not involved in IL-8 production by neutrophils stimulated by bacterial DNA. 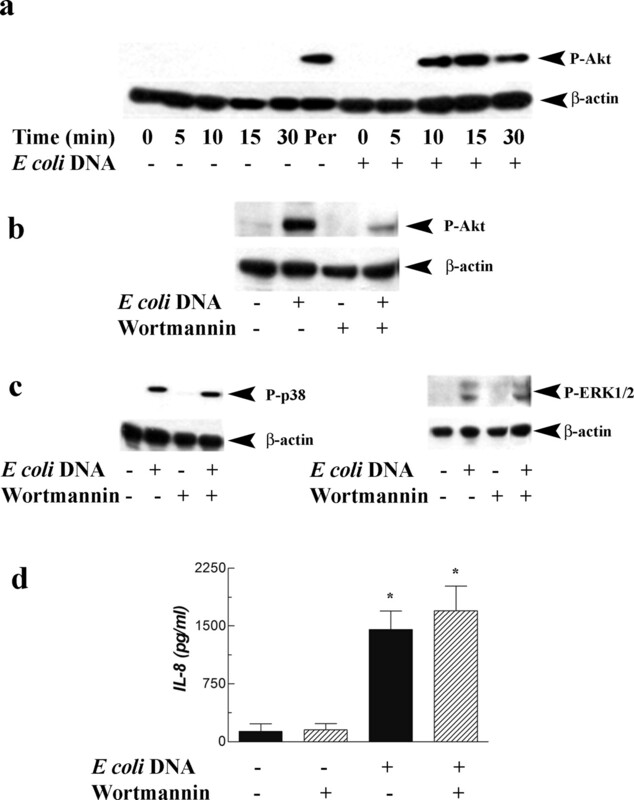 Cells were pretreated with wortmannin (50 nM) for 15 min at 37°C and incubated in the presence of E. coli DNA (100 μg/ml) for 3 h. The IL-8 released to medium was determined by ELISA. Results are expressed as picograms per milliliter of IL-8 released to culture supernatant per 106 neutrophils. Data represent the mean ± SEM of six experiments. ∗, p < 0.01 compared with unstimulated cells. Since previous studies indicated that PI3K/Akt can modulate the activation of p38 MAPK and ERK1/2 (25, 27), we examined the phosphorylation of p38 and ERK 1/2 in neutrophils pretreated with wortmannin. Results in Fig. 3⇑c show that PI3K inhibition did not affect p38 MAPK and ERK1/2 phosphorylation triggered by bacterial DNA, indicating that activation of these MAPKs was not under regulation of the PI3K. Functional studies were then conducted to examine the role of the PI3K pathway on neutrophil activation induced by bacterial DNA. Results indicated that wortmannin did not inhibit the up-regulation of CD11b expression (data not shown) nor the production of IL-8 induced by bacterial DNA (Fig. 3⇑d), supporting that the stimulation of these responses did not involve the PI3K pathway. We next examined whether NF-κB translocation is triggered upon neutrophil stimulation with bacterial DNA. To this aim, nuclear extracts of neutrophils incubated with E. coli DNA (100 μg/ml) during 0, 5, 15, and 30 min were obtained. They were assayed to detect NF-κB by EMSA. Results revealed that this transcription factor was activated following neutrophil treatment with E. coli DNA (Fig. 4⇓a). The specificity of NF-κB binding in the EMSA was confirmed by incubation of nuclear extracts with 20-fold excess of cold-specific ODN, which completely removed the NF-κB band. By contrast, a 20-fold excess of a cold-mutant ODN did not reduce NF-κB signal. To detect the composition of the NF-κB band visualized by EMSA, nuclear extracts from neutrophils stimulated by E. coli DNA were incubated with Abs anti-p50 (NF-κBI) or anti-p65 (Rel A). Whereas the anti-p50 Ab completely impaired the detection of the complex, the anti-p65 Ab only partially reduced it (Fig. 4⇓a), suggesting the NF-κB complex induced by E. coli DNA consisted both of p65/p50 heterodimers and p50/p50 homodimers. Bacterial DNA induces NF-κB activation in human neutrophils. a, Neutrophils were stimulated by E. coli DNA (100 μg/ml) during 0, 5, 15, and 30 min. Afterward, nuclear extracts were prepared, and the presence of NK-κB in these extracts was assessed by EMSA using a consensus NF-κB probe. Specificity of the bands was assessed by competition with a cold probe (cold-S-oligo) vs a mutated cold probe (cold-NS-oligo) and supershift experiments. A 20-fold excess of unlabeled NF-κB probe and mutated cold probe and anti-p65- and p50-specific Abs were added to nuclear extracts before incubation with a labeled NF-κB ODN probe (n = 3). Two specific bands could be identified: the lower band as the p50/p50 homodimer and the upper band as the p50/p65 heterodimer. b, Western blot analysis of IκBα expression demonstrating time course of IκBα degradation under treatment of neutrophils with E. coli DNA (100 μg/ml). c and d, Selective inhibition of p38 MAPK or PI3K does not affect neutrophil NF-κB activation induced by bacterial DNA. Neutrophils pretreated with SB203580 (5 μM) (c) or wortmannin (50 nM) (d) for 15 min at 37°C were stimulated with E. coli DNA (100 μg/ml) for 15 min at 37°C. Then, IκBα expression was analyzed by immunoblotting using a rabbit polyclonal-specific Ab. Immunoblots are representative of three independent experiments. 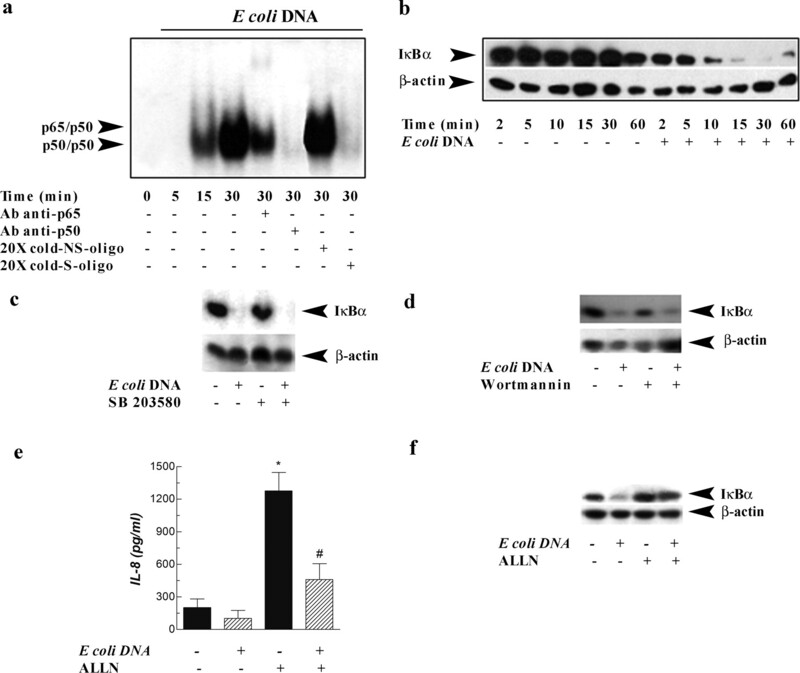 e, Inhibition of IL-8 production by pretreatment of neutrophils with ALLN. Neutrophils pretreated with ALLN (10 μM) for 15 min at 37°C were stimulated with E. coli DNA (100 μg/ml) for 3 h at 37°C. Results are expressed as picograms per milliliter of IL-8 released per 106 neutrophils. Data represent the mean ± SEM of six experiments. ∗, p < 0.01 vs basal release and #, p < 0.01 compared with bacterial DNA-stimulated cells. f, Neutrophils pretreated with ALLN (10 μM) for 15 min at 37°C were stimulated with E. coli DNA (100 μg/ml) for 15 min at 37°C. Then IκBα expression was analyzed by immunoblotting using a rabbit polyclonal-specific Ab. Immunoblots are representative of two independent experiments. Neutrophil NF-κB activation by bacterial DNA was confirmed by the decrease in IκBα levels observed between 10 and 60 min (Fig. 4⇑b). Since neutrophil stimulation by LPS results in p38- and PI3K-dependent NF-κB activation (17), we investigated whether this pathway was also operative in neutrophils stimulated with bacterial DNA. 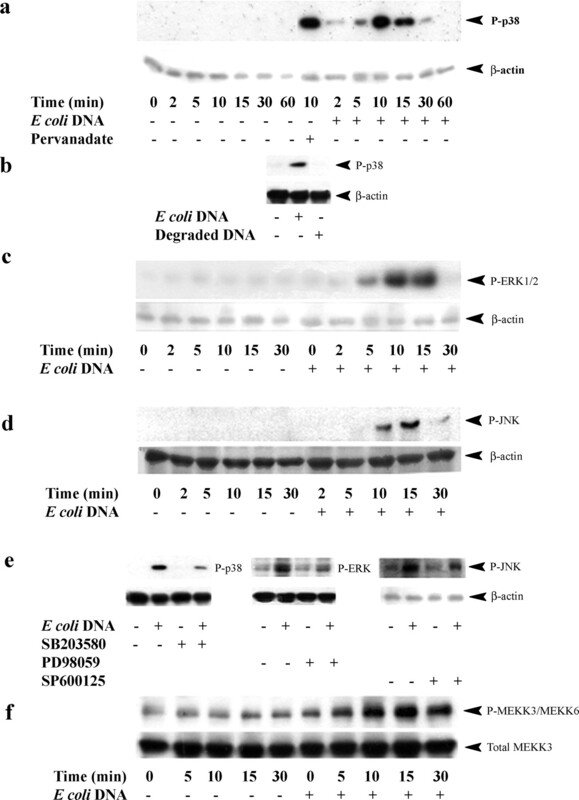 Cells were pretreated with pharmacological inhibitors of p38 MAPK or PI3K and subsequently stimulated with E. coli DNA before Western blotting analyses of extracts were performed to determine IκBα expression. Results indicated that neither SB203580 nor wortmannin were able to block IκBα degradation induced by bacterial DNA, suggesting that NF-κB activation is not under the regulation of p38 MAPK nor PI3K (Fig. 4⇑, c and d). Then, we analyzed whether the induction of IL-8 production by neutrophils stimulated by bacterial DNA was dependent on NF-κB activation. To this aim, we evaluated the effect of ALLN, a potent proteasome inhibitor that has been shown to inhibit IκBα degradation and in turn the activation of NF-κB. In accordance to the presence of a NF-κB binding site in its gene promoter (28), secretion of IL-8 stimulated by bacterial DNA was markedly inhibited by preincubation of neutrophils with ALLN (Fig. 4⇑e). As expected, ALLN markedly prevented IκBα degradation induced by bacterial DNA (Fig. 4⇑f). Considering that not only NF-κB but also AP-1 are regulatory elements for IL-8 gene expression (28), EMSAs were performed to investigate the ability of bacterial DNA to activate AP-1. As shown in Fig. 5⇓, unstimulated neutrophils did not display AP-1 DNA binding activity. By contrast, it was observed in nuclear extracts from neutrophils stimulated for 5, 15, and 30 min with E. coli DNA being the maximal activation detected after 30 min stimulation. To confirm the specificity of this signal, competition studies were performed with increasing amounts of the unlabeled specific probe. As shown in Fig. 5⇓, AP-1 binding to the 32P-labeled ODN probe was completely inhibited by a 20-fold excess of unlabeled specific probe. By contrast, a 20-fold excess of a cold nonspecific probe did not remove the band. Bacterial DNA induces neutrophil AP-1 activation. Neutrophils were stimulated by E. coli DNA (100 μg/ml) during 0, 5, 15, and 30 min. Afterward, nuclear extracts were prepared, and the presence of AP-1 DNA binding activity was determined by using a consensus AP-1 ODN. EMSAs were also conducted using nuclear extracts of neutrophils stimulated by bacterial DNA during 30 min at 37°C in the presence of anti-c-Jun-specific Ab to determine the composition of the complexes. Specificity of the bands was assessed by competition with a 20-fold molar excess of either unlabeled probe (cold-S-oligo) or a mutated cold probe (cold-NS-oligo). AP-1 proteins consist of a variety of homo- and heterodimers, including members of the Fos and Jun families (29). We found that the band of AP-1/DNA complex nearly disappeared by the addition of a specific Ab against c-Jun to the nuclear extracts (Fig. 5⇑). Thus, the supershift assay suggested that E. coli DNA-induced AP-1 DNA binding proteins mainly contained c-Jun. Our previous studies have suggested that TLR9 is not involved in neutrophil activation by bacterial DNA (1). However, as stated, TLRs are the best characterized pattern recognition receptors in neutrophils, in which lies most of their pathogen recognition capacity (6). Moreover, TLRs recognize distinct structural components of pathogens and trigger a signaling cascade that involves association of its intracellular Toll-IL-1R (TIR)-signaling domain with the adaptor molecule MyD88 (30, 31). This molecule recruits IRAK-4, allowing association and phosphorylation of IRAK-1, which in turn recruits TRAF6 (7). From this signaling complex, downstream cascades ultimately lead to activation of NF-κB, regulating proinflammatory gene transcription (7). Stimulation of TLR also typically leads to activation of MAPKs and AP-1 and activation of PI3K (6, 7, 8, 9). Therefore, we considered the possibility that the highly conserved TLR signaling cascade was involved in CpG-independent neutrophil activation. We first analyzed the ability of bacterial DNA to trigger IRAK-1 kinase activity by means of an in vitro kinase assay against the exogenous substrate MBP. As shown in Fig. 6⇓a, IRAK-1 exhibited an increased kinase activity within 2 min after bacterial DNA stimulation as compared with control cells, which gradually decreased to turn nearly undetectable by 10 min poststimulation. Induction of IRAK-1 kinase activity in response to 5 min stimulation with LPS is shown as a positive control (Fig. 6⇓a). IRAK-1 is activated upon neutrophil stimulation with bacterial DNA. Neutrophils (30× 106/ml) were stimulated with bacterial DNA (100 μg/ml), LPS (500 ng/ml), or medium (control) during the indicated times. Cell extracts were immunoprecipitated (IP) with anti-IRAK-1 (a and b) or anti-TRAF6 (d) Abs. IRAK-1 immunoprecipitates were used (a) in a kinase assay to determine the ability of IRAK-1 to phosphorylate the exogenous substrate MBP (n = 2) and (b) to analyze coimmunoprecipitation of MyD88 or TRAF6 by immunoblotting (IB). c, Immunoblots of whole-cell extracts obtained from neutrophils stimulated or not with E. coli DNA (100 μg/ml) for different times revealed with a rabbit polyclonal anti-IRAK-1 Ab. Immunoblots are representative of at least three independent experiments. d, TRAF6 immunoprecipitates were used to analyze coimmunoprecipitation of IRAK-1 by immunoblotting. Note: calf fetal serum was added to neutrophils before LPS stimulation to provide a source of LBP. We then analyzed whether bacterial DNA induced the coimmunoprecipitation of IRAK-1 with MyD88 and TRAF6. Thus, neutrophils were subjected to bacterial DNA treatment during 2, 5, or 10 min at 37°C, cell extracts were prepared as described under Materials and Methods, and IRAK-1 was immunoprecipitated followed by Western blotting. We first analyzed whether IRAK-1 associated with MyD88 and TRAF6 upon bacterial DNA triggering (Fig. 6⇑b). To this end, blots were probed with anti-TRAF6- or anti-MyD88-specific Abs. We found that both TRAF6 and MyD88 coimmunoprecipitated with IRAK-1 either in unstimulated or stimulated neutrophils. However, an increased association between IRAK-1 and MyD88 was observed by 2 min poststimulation with bacterial DNA, which gradually decreased to turn undetectable by 10 min poststimulation. By contrast, although an enhanced association between IRAK-1 and TRAF6 was not observed in stimulated cells, TRAF6 was no longer detected after 10 min of bacterial DNA stimulation (Fig. 6⇑b). As expected, IRAK-1 underwent partial degradation upon stimulation with bacterial DNA as evidenced in immunoblots of whole-cell extracts with anti-IRAK-1 Ab (Fig. 6⇑c). Of note, we could not detect the phosphorylated forms of IRAK-1 in these assays probably due to sensitivity limitations of the assay. 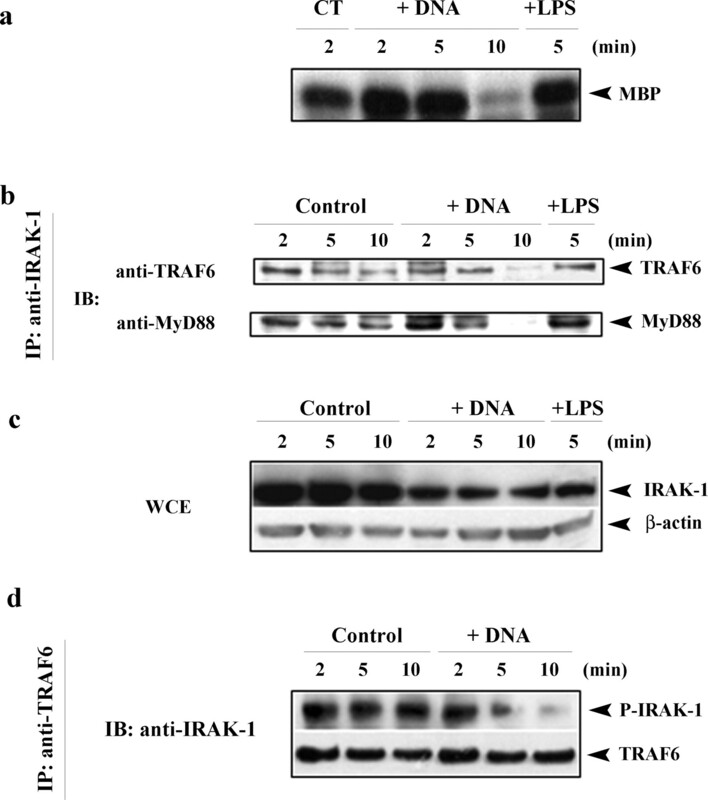 However, when TRAF6 was immunoprecipitated and the membrane probed with an anti-IRAK-1 Ab, only a slower migrating band compatible with a phosphorylated form of IRAK-1 was detected (Fig. 6⇑d) (7, 32). This is consistent with the previous observation that TRAF6 associates to IRAK-1 once it undergoes phosphorylation (7). Although phospho-IRAK-1 was detected in either unstimulated or stimulated neutrophils, it was barely detected by 10 min poststimulation with bacterial DNA (Fig. 6⇑d), in agreement with the notion that it becomes degraded. To confirm a role for MyD88 pathway in cell activation induced by bacterial DNA, we performed additional experiments by using neutrophils from MyD88−/− BMC mice. Considering that mice do not produce IL-8 and the production of its murine counterpart, the chemokine MIP-2, is restricted to a small subpopulation of bone marrow neutrophils and is not increased upon neutrophil stimulation (33), we restricted our analysis of murine neutrophil functions to the determination of CD11b expression. Results in Fig. 7⇓a indicate that CD11b up-regulation induced by bacterial DNA was markedly inhibited in MyD88−/− neutrophils as compared with that observed in wild-type neutrophils. Moreover, CD11b up-regulation induced by both single-stranded methylated E. coli DNA (ss-metDNA) and double-stranded E. coli DNA (dsDNA) observed in wild-type neutrophils was also markedly reduced in MyD88−/− neutrophils (Fig. 7⇓a), supporting the notion that bacterial DNA activates neutrophils by a CpG-independent MyD88-dependent pathway. Responses induced by both Pam3CSK4, a TLR2 agonist that transduces through a MyD88-pathway, and PMA, a TLR-independent agonist, are shown as controls (Fig. 7⇓a). Bacterial DNA induces neutrophil activation through a MyD88-dependent, TLR9-independent mechanism. Neutrophils from wild-type and MyD88−/− BMC mice (a) or wild-type and TLR9−/− BMC mice (b) were stimulated with either single-stranded E. coli DNA (1 or 100 μg/ml), single-stranded methylated E. coli DNA (100 μg/ml) (ss-metDNA), double-stranded E. coli DNA (dsDNA) (100 μg/ml), Pam3CSK4 (1 μg/ml), or PMA (20 ng/ml) for 1 h at 37°C, then were stained with FITC-conjugated anti-Gr 1 and PE-conjugated anti-CD11b mAbs or isotype controls mAbs during 20 min at 4°C. Then, the expression of CD11b was evaluated on the high Gr 1-expressing cells by flow cytometry. Data represent the mean ± SEM of five experiments. ∗, p < 0.05 wild-type vs MyD88−/− neutrophils and #, p < 0.05 compared with the expression in nonstimulated cells. To confirm that TLR9 is not involved in neutrophil activation by bacterial DNA, assays were performed with neutrophils from TLR9−/− BMC mice. Results indicated that both single-stranded E. coli DNA and single-stranded methylated E. coli DNA were able to induce CD11b up-regulation in TLR9−/− neutrophils (Fig. 7⇑b). Neutrophils provide the rapid deployment and effector arm of the innate immune system (34). They display a wide variety of pattern recognition receptors, which account for the recognition of a myriad of invading microorganisms (6, 34, 35). Thereafter, they release inflammatory mediators and antibacterial agents. As we have previously shown, neutrophils can be activated by bacterial DNA through a CpG-independent mechanism (1). Moreover, additional studies demonstrated that neutrophils respond in a CpG-independent phosphorotioate-dependent manner to ODNs (36). These findings are in accordance with different reports that support the existence of non-CpG molecular motifs in natural DNA or synthetic ODN responsible for immune cell activation (4, 5, 37, 38, 39, 40). Even though some of these reports sustain a role for TLR9 in CpG-independent cell activation, other evidences account for TLR9-independent mechanisms (41, 42). The current study was undertaken to identify the signaling pathways triggered upon neutrophil stimulation by bacterial DNA. We found that bacterial DNA triggers the phosphorylation of p38, ERK 1/2, and JNK MAPKs, as well as PI3K activation, and also induces NF-κB and AP-1 activation (Fig. 8⇓). Our results show that the activations of p38 MAPK, ERK1/2, and JNK are functionally correlated with the up-regulation of CD11b induced by bacterial DNA. Moreover, the activation of p38 and ERK1/2 MAPKs, as well as NF-κB, seems to be involved in the stimulation of IL-8 production induced by bacterial DNA. Our data support the notion that different signaling pathways work independently to stimulate neutrophil function. In fact, selective inhibition of p38 or PI3K activation did not affect bacterial DNA-induced IκBα degradation, suggesting that in contrast to the observations made in LPS- and CpG-stimulated cells, neither p38 nor PI3K modulate NF-κB nuclear translocation (Fig. 8⇓) (17, 43, 44). Moreover, a role for both NF-κB and AP-1 in the regulation of IL-8 production induced by bacterial DNA was supported by the fact that proteasome inhibition mediated by ALLN and the selective inhibition of p38 MAPK, an upstream signaling molecule for AP-1 activation, partially reduced IL-8 secretion. Surprisingly, another upstream signaling molecule for AP-1 activation, JNK MAPK, appears to negatively modulate NF-κB-dependent transcription. This contention is supported by experiments performed by selectively inhibiting JNK activation which markedly increased the production of IL-8 induced by bacterial DNA. In line with this observation, previous studies have shown that JNK is able to inhibit p65-dependent transcription (45). Model for neutrophil signaling mechanisms triggered by bacterial DNA. Although the activation of the intermediates indicated in the figure have been probed, a causal relationship between TIR pathway activation and MAPKs, AP-1 and NF-κB, has not been directly determined. Discontinued lines indicate hypothetic connections. Criss-cross lines symbolize the absence of regulation by the indicated kinase. Our data indicating that NF-κB is not under regulation of p38 nor PI3K are consistent with results observed upon stimulation of TLR, which usually leads to NF-κB translocation through a pathway not involving the activation of p38 and PI3K (8). Previous studies showed that bacterial DNA delays neutrophil apoptosis (46). These studies also detected ERK and Akt phosphorylation after neutrophil stimulation with bacterial DNA but failed to demonstrate a role for p38 MAPK. Differences between these results and our findings might be related not only to the different functions analyzed in each study (apoptosis vs activation) but also to the fact that this work employed a low concentration of SB203580, which could not be able to effectively inhibit the p38 MAPK, a possibility that was not addressed by the authors. Prior studies demonstrated that MEKK3 plays a crucial role in IL-1- and LPS-induced activation of NF-κB, p38, and JNK but not in CpG-induced activation of primary mouse embryonic fibroblast cell lines (20). We found that stimulation of neutrophils by bacterial DNA induces the appearance of a band consistent with phosphorylated MEKK3/MEKK6. Considering previous reports indicating that human neutrophils possess MEKK3 but lack MEKK6 (17), our results suggest that activation of P38, JNK, and/or NF-κB might proceed through the activation of MEKK3. Our results also indicated that TLR/IL-1R signaling pathway is activated upon neutrophil stimulation with bacterial DNA. In fact, a rapid induction of IRAK-1 kinase activity was observed after bacterial DNA stimulation. This kinase activity decreased at the time that phosphorylated IRAK-1 underwent degradation. Also supporting the TLR/IL-1R signaling pathway activation, we observed that coimmunopreciptation of MyD88 and IRAK-1 was increased by 2 min after stimulation. Contrasting with this finding, we were unable to detect an enhanced coimmunoprecipitation of TRAF6 and IRAK-1 in neutrophils stimulated either with bacterial DNA or LPS compared with untreated cells, an observation that could be due to a high rate of dissociation of TRAF6 from the IRAK-1/TRAF6 complex under our experimental setting. A role for MyD88 pathway was confirmed by the fact that CD11b up-regulation induced by bacterial DNA was markedly reduced in neutrophils from MyD88−/− BMC mice. Moreover, both single-stranded methylated E. coli DNA and double-stranded E. coli DNA were also able to induce CD11b up-regulation in wild-type neutrophils, but this response was markedly diminished in MyD88−/− neutrophils. On the other hand, our results indicating that both single-stranded E. coli DNA and single-stranded methylated E. coli DNA were able to induce CD11b up-regulation in TLR9−/− neutrophils indicated that neutrophil activation by bacterial DNA does not involve TLR9. These findings are in accordance with our previous observations indicating that neither agents that interfere with TLR9 signaling nor bacterial DNA immobilization affects its ability to trigger neutrophil activation (1). Taken together, our findings suggest that bacterial DNA activates neutrophils by a CpG-independent MyD88-dependent pathway that does not involve TLR9. Studies performed with human neutrophils by József et al. (46, 47) showed that bacterial DNA moderately delays apoptosis and induces IL-8 secretion through a CpG- and TLR9-dependent mechanism. Their studies were based on results obtained by using endosomal acidification inhibitors such as chloroquine and bafilomycin A and CpG-methylated DNA but did not include the use of TLR9 knockout mice. Remarkably, our findings contrast with those reported by József’s et al. In fact, our previous (1) and present results showed that CpG methylation of bacterial DNA did not inhibit its ability to trigger neutrophil activation (IL-8 secretion, CD11b up-regulation, and shape change). These results together with those obtained with TLR9-deficient neutrophils support that bacterial DNA activates neutrophils by a CpG- and TLR9-independent pathway. To date, we cannot understand the reasons for these contrasting findings. However, it should be noted that our results are in line with previous reports indicating that neutrophils differ from other leukocyte populations in their ability to respond to CpG-DNA. In fact, all previous studies aimed to analyze the effects of ODN on neutrophil function have shown that neutrophils are not activated by phosphodiester ODN regardless of CpG content and can only be stimulated by backbone-substituted phosphorothioate ODN in a sequence-independent (CpG-independent) manner (35, 36, 48). Considering that members of the TLR-IL-1R superfamily are evolutionary conserved receptor molecules, essential for host defense against infectious pathogens (8, 49), it is possible to speculate that a TLR distinct to TLR9 is involved in neutrophil recognition of bacterial DNA. However, our results do not rule out that a molecule distinct to TLR was responsible for DNA recognition and recruits, per se, TIR intermediates to promote neutrophil activation. Such a role has been demonstrated for the leukocyte integrin Mac-1 (50). Nevertheless, even though this adhesion molecule has the capacity to bind ODNs (51), we have previously demonstrated that it is not involved in the activation of neutrophils by bacterial DNA (1). Experiments to determine the identity of the receptor involved in neutrophil activation by bacterial DNA are being currently undertaken in our laboratory. Taken together, our results suggest that bacterial DNA induces human neutrophil activation by triggering the TIR signaling pathway, which in turn might activate MAPK pathways and AP-1 and stimulate NF-κB translocation (Fig. 8⇑). We thanks Dr. Mirta Giordano for helpful discussion and Selma Tolosa, Evelia López, and Emilia Giri for their valuable assistance. ↵1 This work was supported by grants from Consejo Nacional de Investigaciones Científicas y Técnicas de Argentina, Agencia Nacional de Promoción Científica y Tecnológica, Universidad de Buenos Aires, and Fundación Alberto Roemmers (Argentina). ↵3 Abbreviations used in this paper: BMC, bone marrow chimeric; MEKK, mitogen-activated protein kinase kinase; IRAK, IL-1R-associated kinase; Pam3CSK4, Pam3-Cys-Ser-Lys4; TRAF6, TNFR-associated factor 6; ALLN, N-acetyl-leucinyl-leucinyl-norleucinal; AEBSF, 4-(2-aminoethyl) benzenesulfonylfluoride; ODN, oligonucleotide; MBP, myelin basic protein; TIR, Toll-IL-1R. Trevani, A. S., A. Chorny, G. Salamone, M. Vermeulen, R. Gamberale, J. Schettini, S. Raiden, J. Geffner. 2003. Bacterial DNA activates human neutrophils by a CpG-independent pathway. Eur. J. Immunol. 33: 3164-3174. Yasuda, K., Y. Ogawa, M. Kishimoto, T. Takagi, M. Hashida, Y. Takakura. 2002. Plasmid DNA activates murine macrophages to induce inflammatory cytokines in a CpG motif-independent manner by complex formation with cationic liposomes. Biochem. Biophys. Res. Commun. 293: 344-348. Zhao, H., H. Hemmi, S. Akira, S. H. Cheng, R. K. Scheule, N. S. Yew. 2004. Contribution of Toll-like receptor 9 signaling to the acute inflammatory response to nonviral vectors. Mol. Ther. 9: 241-248. Elias, F., J. Flo, R. A. Lopez, J. Zorzopulos, A. Montaner, J. M. Rodriguez. 2003. Strong cytosine-guanosine-independent immunostimulation in humans and other primates by synthetic oligodeoxynucleotides with PyNTTTTGT motifs. J. Immunol. 171: 3697-3704. Janssens, S., R. Beyaert. 2003. Functional diversity and regulation of different interleukin-1 receptor-associated kinase (IRAK) family members. Mol. Cell 11: 293-302. Trevani, A. S., G. Andonegui, M. Giordano, D. H. Lopez, R. Gamberale, F. Minucci, J. R. Geffner. 1999. Extracellular acidification induces human neutrophil activation. J. Immunol. 162: 4849-4857. Soler-Rodriguez, A. M., H. Zhang, H. S. Lichenstein, N. Qureshi, D. W. Niesel, S. E. Crowe, J. W. Peterson, G. R. Klimpel. 2000. Neutrophil activation by bacterial lipoprotein versus lipopolysaccharide: differential requirements for serum and CD14. J. Immunol. 164: 2674-2683. Costas, M., T. Trapp, M. P. Pereda, J. Sauer, R. Rupprecht, V. E. Nahmod, J. M. Reul, F. Holsboer, E. Arzt. 1996. Molecular and functional evidence for in vitro cytokine enhancement of human and murine target cell sensitivity to glucocorticoids: TNF-α priming increases glucocorticoid inhibition of TNF-α-induced cytotoxicity/apoptosis. J. Clin. Invest. 98: 1409-1416. Tumpey, T. M., R. Fenton, S. Molesworth-Kenyon, J. E. Oakes, R. N. Lausch. 2002. Role for macrophage inflammatory protein 2 (MIP-2), MIP-1α, and interleukin-1α in the delayed-type hypersensitivity response to viral antigen. J. Virol. 76: 8050-8057. Suzuki, K., M. Hino, F. Hato, N. Tatsumi, S. Kitagawa. 1999. Cytokine-specific activation of distinct mitogen-activated protein kinase subtype cascades in human neutrophils stimulated by granulocyte colony-stimulating factor, granulocyte-macrophage colony-stimulating factor, and tumor necrosis factor α. Blood 93: 341-349. Suzuki, K., M. Hino, H. Kutsuna, F. Hato, C. Sakamoto, T. Takahashi, N. Tatsumi, S. Kitagawa. 2001. Selective activation of p38 mitogen-activated protein kinase cascade in human neutrophils stimulated by IL-1β. J. Immunol. 167: 5940-5947. Nick, J. A., N. J. Avdi, S. K. Young, L. A. Lehman, P. P. McDonald, S. C. Frasch, M. A. Billstrom, P. M. Henson, G. L. Johnson, G. S. Worthen. 1999. Selective activation and functional significance of p38α mitogen-activated protein kinase in lipopolysaccharide-stimulated neutrophils. J. Clin. Invest. 103: 851-858. Suzuki, K., T. Hasegawa, C. Sakamoto, Y. M. Zhou, F. Hato, M. Hino, N. Tatsumi, S. Kitagawa. 2001. Cleavage of mitogen-activated protein kinases in human neutrophils undergoing apoptosis: role in decreased responsiveness to inflammatory cytokines. J. Immunol. 166: 1185-1192. Huang, Q., J. Yang, Y. Lin, C. Walker, J. Cheng, Z. G. Liu, B. Su. 2004. 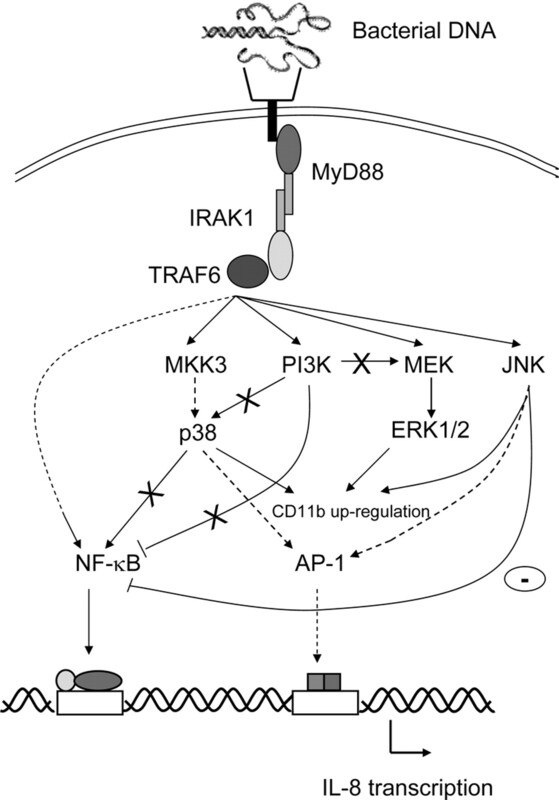 Differential regulation of interleukin 1 receptor and Toll-like receptor signaling by MEKK3. Nat. Immunol. 5: 98-103. Arndt, P. G., N. Suzuki, N. J. Avdi, K. C. Malcolm, G. S. Worthen. 2004. Lipopolysaccharide-induced c-Jun NH2-terminal kinase activation in human neutrophils: role of phosphatidylinositol 3-Kinase and Syk-mediated pathways. J. Biol. Chem. 279: 10883-10891. Capodici, C., S. Hanft, M. Feoktistov, M. H. Pillinger. 1998. Phosphatidylinositol 3-kinase mediates chemoattractant-stimulated, CD11b/CD18-dependent cell-cell adhesion of human neutrophils: evidence for an ERK-independent pathway. J. Immunol. 160: 1901-1909. Wymann, M. P., S. Sozzani, F. Altruda, A. Mantovani, E. Hirsch. 2000. Lipids on the move: phosphoinositide 3-kinases in leukocyte function. Immunol. Today 21: 260-264. Fukao, T., S. Koyasu. 2003. PI3K and negative regulation of TLR signaling. Trends Immunol. 24: 358-363. Mukaida, N., S. Okamoto, Y. Ishikawa, K. Matsushima. 1994. Molecular mechanism of interleukin-8 gene expression. J. Leukocyte Biol. 56: 554-558. Hess, J., P. Angel, M. Schorpp-Kistner. 2004. AP-1 subunits: quarrel and harmony among siblings. J Cell Sci. 117: 5965-5973. Akazawa, T., H. Masuda, Y. Saeki, M. Matsumoto, K. Takeda, K. Tsujimura, K. Kuzushima, T. Takahashi, I. Azuma, S. Akira, et al 2004. Adjuvant-mediated tumor regression and tumor-specific cytotoxic response are impaired in MyD88-deficient mice. Cancer Res. 64: 757-764. Takaesu, G., J. Ninomiya-Tsuji, S. Kishida, X. Li, G. R. Stark, K. Matsumoto. 2001. Interleukin-1 (IL-1) receptor-associated kinase leads to activation of TAK1 by inducing TAB2 translocation in the IL-1 signaling pathway. Mol. Cell. Biol. 21: 2475-2484. Matzer, S. P., F. Rodel, R. M. Strieter, M. Rollinghoff, H. U. Beuscher. 2004. Constitutive expression of CXCL2/MIP-2 is restricted to a Gr-1high, CD11b+,CD62Lhigh subset of bone marrow derived granulocytes. Int. Immunol. 16: 1675-1683. Witko-Sarsat, V., P. Rieu, B. Descamps-Latscha, P. Lesavre, L. Halbwachs-Mecarelli. 2000. Neutrophils: molecules, functions and pathophysiological aspects. Lab. Invest. 80: 617-653. Itou, T., T. Endo, T. Sakai, A. Karlsson, L. V. Collins. 2005. Immunostimulatory oligodeoxynucleotides induce dolphin neutrophil NADPH-oxidase activation in a CpG-independent but phosphorothioate backbone-dependent manner. Dev. Comp. Immunol. 29: 583-588. Vollmer, J., R. D. Weeratna, M. Jurk, U. Samulowitz, M. J. McCluskie, P. Payette, H. L. Davis, C. Schetter, A. M. Krieg. 2004. Oligodeoxynucleotides lacking CpG dinucleotides mediate Toll-like receptor 9 dependent T helper type 2 biased immune stimulation. Immunology 113: 212-223. Vollmer, J., A. Janosch, M. Laucht, Z. K. Ballas, C. Schetter, A. M. Krieg. 2002. Highly immunostimulatory CpG-free oligodeoxynucleotides for activation of human leukocytes. Antisense Nucleic Acid Drug Dev. 12: 165-175. Wang, J., R. Alvarez, G. Roderiquez, E. Guan, Q. Caldwell, J. Wang, M. Phelan, M. A. Norcross. 2005. CpG-independent synergistic induction of β-chemokines and a dendritic cell phenotype by orthophosphorothioate oligodeoxynucleotides and granulocyte-macrophage colony-stimulating factor in elutriated human primary monocytes. J. Immunol. 174: 6113-6121. Filion, M. C., N. Saha, M. Gueddi, N. C. Phillips. 2003. Development of short non-CpG phosphodiester oligonucleotides as immune stimulatory agents. Vaccine 21: 983-989. Verthelyi, D., R. A. Zeuner. 2003. Differential signaling by CpG DNA in DCs and B cells: not just TLR9. Trends Immunol. 24: 519-522. Yasuda, K., P. Yu, C. J. Kirschning, B. Schlatter, F. Schmitz, A. Heit, S. Bauer, H. Hochrein, H. Wagner. 2005. Endosomal translocation of vertebrate DNA activates dendritic cells via TLR9-dependent and -independent pathways. J. Immunol. 174: 6129-6136. Tsujimura, H., T. Tamura, H. J. Kong, A. Nishiyama, K. J. Ishii, D. M. Klinman, K. Ozato. 2004. Toll-like receptor 9 signaling activates NF-κB through IFN regulatory factor-8/IFN consensus sequence binding protein in dendritic cells. J. Immunol. 172: 6820-6827. Takeshita, F., I. Gursel, K. J. Ishii, K. Suzuki, M. Gursel, D. M. Klinman. 2004. Signal transduction pathways mediated by the interaction of CpG DNA with Toll-like receptor 9. Semin. Immunol. 16: 17-22. Sanchez-Perez, I., S. A. Benitah, M. Martinez-Gomariz, J. C. Lacal, R. Perona. 2002. Cell stress and MEKK1-mediated c-Jun activation modulate NFκB activity and cell viability. Mol. Biol. Cell 13: 2933-2945. Jozsef, L., T. Khreiss, J. G. Filep. 2004. CpG motifs in bacterial DNA delay apoptosis of neutrophil granulocytes. FASEB J. 18: 1776-1778. Jozsef, L., T. Khreiss, D. El Kebir, J. G. Filep. 2006. Activation of TLR-9 induces IL-8 secretion through peroxynitrite signaling in human neutrophils. J. Immunol. 176: 1195-1202. Bylund, J., M. Samuelsson, A. Tarkowski, A. Karlsson, L. V. Collins. 2002. Immunostimulatory DNA induces degranulation and NADPH-oxidase activation in human neutrophils while concomitantly inhibiting chemotaxis and phagocytosis. Eur. J. Immunol. 32: 2847-2856. Akira, S.. 2003. Mammalian Toll-like receptors. Curr. Opin. Immunol. 15: 5-11. Shi, C., X. Zhang, Z. Chen, M. K. Robinson, D. I. Simon. 2001. Leukocyte integrin Mac-1 recruits toll/interleukin-1 receptor superfamily signaling intermediates to modulate NF-κB activity. Circ. Res. 89: 859-865. Benimetskaya, L., J. D. Loike, Z. Khaled, G. Loike, S. C. Silverstein, L. Cao, J. el Khoury, T. Q. Cai, C. A. Stein. 1997. Mac-1 (CD11b/CD18) is an oligodeoxynucleotide-binding protein. Nat. Med. 3: 414-420.